Although this book is published by Yale, Klehvniuk is a research fellow at the Russian national archives, and has devoted twenty years of his life to studying Stalin, the ruler that held much of Eastern Europe in an iron grasp from 1929-1953, when he died. That must be a really dark place, but he’s done a brilliant job. Many thanks go to Net Galley and Yale University Press for allowing me a free peek. This book is available for purchase right now. The author tells us that revisionists have undertaken to rehabilitate Stalin’s reputation lately, and to attribute his various unspeakable crimes against humanity to those below him. What a thought! Many previously secret archives were opened in the early 1990s, and our researcher has been busy indeed. He begins with a brief but well done recounting of Stalin’s childhood, which he says was grim, but not grimmer than that of most of his peers, and surely not sufficiently grim to account for the monster he would become later in life. Then he discusses the Russian Revolution, and the relationship and struggle among its leadership, most notably Lenin (of whom he has a less favorable view than my own), Trotsky, and Stalin. Lenin and Trotsky disagreed over a number of things, primarily the role of the peasantry in the new society and its government. Lenin pushed Stalin to a higher level of leadership for a brief while because he was not happy with Trotsky, who in any case was in charge of the military, a critical task all by itself at the time. However, when Lenin’s health began to fail and he realized he would have to select a successor, he turned to Trotsky. By then, unfortunately, Stalin had built himself a clique within the leadership. A struggle for control ensued. Stalin came out on top, and Trotsky was banished. In 1940, Stalin paid a henchman to go to Mexico City and kill him with an ice pick. After Lenin’s death, government was largely by committee, and although ruthless decisions sometimes had to be made at a time when there were still Mensheviks (Social Democrats) who would turn the revolutionary achievement into a bourgeois state, no one person had the ultimate power over the lives of his comrades. Over the next few years, however, the German Revolution failed and scarce resources had to be allocated. 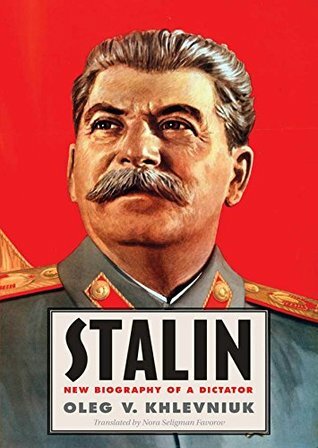 Stalin consolidated his hold on authority and the precious resources that could not be distributed sufficiently to keep everyone under the Soviet umbrella warm and fed went first (and increasingly lavishly) to the corrupt bureaucratic caste that controlled the Soviet Union, foremost Stalin himself. After that came resources for the workers in Russian cities; and after that came everyone else. The peasantry, which had been in a state close to slavery under the Tsar, were still shut off from the benefits of the Revolution, and Stalin undertook to force them to produce food for the city while punishing and often executing those that tried to stockpile a small amount on which to sustain their own families. Klehvniuk gives a good deal of space, and rightly so, to the Great Terror of 1937-1938, when Stalin began suspecting all sorts of people, those close to him, far away, sometimes in large groups, of conspiring against him. He had them rounded up and executed. There even came a point in his career when he was having family members rounded up and shot. Toward the end of his life it was hard to find a qualified physician to treat him, because Stalin had been having so many doctors arrested and shot. An intriguing question that will probably never be answered has to do with the very congested state of his arteries upon autopsy. How much of his behavior can be associated with physical causes, possibly including dementia? He was one mean old man when he died. It’s a haunting consideration. This reviewer was already familiar with a lot of the basic facts of Russian history, and moreso with the Bolshevik Revolution, Lenin, and Trotsky. Nevertheless I think that the interested lay reader, if not overly attached to remembering the names of all of the secondary players that came and went, ought to be able to make it through this work and find it as absorbing as I did. It’s dark material, and I read other things in between sessions in order to keep my own mood from sliding. That said, I don’t think you will find a more knowledgeable writer or a more approachable biography anywhere than this one. Whether for your own academic purposes or simply out of interest and the joy in reading a strong biography, you really aren’t likely to find a better written biography of Stalin nor a more well informed author. It went on sale May 19, so you can get a copy now. Highly recommended! This entry was posted in biography, history and tagged biography, book blog, Eastern European history, Russia, Soviet Union, Stalin, Stalin: New Biography of a Dictator review, World History, World War II by seattlebookmama. Bookmark the permalink.